A journey to the heart of the Israeli-Palestinian crisis. 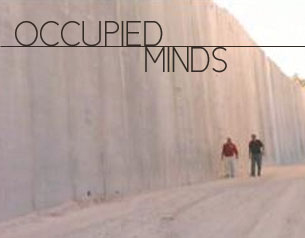 We bring you 'Occupied Minds', a documentary that takes you to the heart of the Palestinian - Israeli conflict. Jamal Dajani and David Michaelis were both born in Jerusalem, but they grew up on different sides of the fence 'the same city, but in reality, different worlds'. David served in the reserves for the Israeli army for 25 years. Now colleagues and close friends, they work together in San Francisco on a Middle Eastern news program. They are the only Palestinian- Israeli team working together in American media. This is their journey back home to look at the conflict from each other's point of view. Jamal and David are both in front of the wall that separates their families. For Jamal it is a symbol of occupation. "Here Uncle Sharon keeps an eye on you with an M-16." For David's family it is a sign of safety. Working together Jamal had forced David to think about new solutions. They agreed on one thing - to test their ideas on the ground. "The reality there is very harsh, but why don't we go over there and do it?" The result is, in the words of Jamal "a narrative not heard in the mass media." We hear the thoughts of leading activists, government officials and civilians on both sides of the conflict. The sounds and singing from a Zionist rally, the memories of ex-Israeli soldiers, and the grievances of Palestinian gunmen and children. All are interwoven to create a rich insight into the conflict. For David, Jerusalem was a refuge for his family from Nazi persecution "I think it's good you hear that I didn't land from Mars or Berlin but have some roots here". Jamal's family had been there for centuries but in 1948 they were pushed out of their home by Jewish settlers. Since 1967 they have lived under Israeli occupation. Standing on the roof of his family home he talks of his ancestors "like a shiver in my body I feel their souls here". "All the Arabs were pushed out" continues Jemal... "Do you feel guilty?. David's response is "No." Walking down a dusty road with the Palestinian gunman, Zakaria al-Zubeida, David is visibly nervous. "A person is burned from the inside, and his life closes in on him... All he wants is to explode. And because of this no-one can stop him. No one", the gunman explains in Hebrew so as to be understood. But, Doctor Yerufes was the victim of a suicide bombing, and losing his sight finds it impossible to forgive. Welcome to Jerusalem. The world capital of suicide bombers. "The children of the first intifada". Are they proof of Palestinian guilt, justification for the wall, or simply the 'poor man's weapon'? Answers are not clear. Is there a way out? "What is needed is love and peace, but that's not for us, we are not so good at that"' Dr Yerufes says wryly. Zionist settlers tell us that the Arabs should go to Jordan and Sinai. Jamal, responds with the optimists viewpoint. For him the answer lies in not two separate states, but one "where everyone shares in the same land and has equal rights." The pair are frustrated by what they witness, and sometimes by each other. Jamal doesn't know "how people do it on a day to day basis." But they do see glimmers of hope. Ex- Israeli soldiers who had served in Hebron are now appalled by what they saw and did. "It is in looking back that you start to understand. You look in the mirror and are ashamed." Today they have founded 'Shovrim Shtika', or 'Breaking the Silence' and educate the Israeli public through lectures, art and photography. Checkpoints, walls and barbed wire. Is there any way through the material and psychological barriers? David fears not. "We haven't found yet the anchor for any kind of light at the end of the tunnel". But as Jamal points out it is just possible that "the darkest spot is under the candle." "You're looking, you're looking and the solution could be somewhere you totally don't forsee."